One of the reasons I became addicted to peanut butter and jelly sandwiches fairly late was my mother's inexpert skills in determining the correct peanut butter-to-jelly ratio for a sandwich. I've come to realize she was a visionary in her use of rye bread. However, because the rye bread she loved was long and thin, she'd spread the peanut butter more like buttering toast. To make the bread stick, she had to use a very generous amount of grape or strawberry preserves. The result was a sweet yet slightly bitter caraway seed-studded sandwich. Then, one day, as an afternoon snack, I had the insight to use stubby slices of Pepperidge Farm cinnamon raisin bread to make a pbj. Genius. Not just the flavor combination of cinnamon, peanut butter, and jelly, but the use of a very small slice of bread resulted in a perfect ratio of bread to peanut butter, requiring only a moderate amount of jelly. Just enough to brighten the smoky flavor of Skippy Chunky, not enough to overpower it. I also was the driving household force encouraging my mother to make the ideological shift from creamy to chunky. And while very small I was convinced that jelly came in two flavors--purple (grape) and red (strawberry) one day in the supermarket I discovered blueberry. I realized that tart flavors like blueberry, cherry, and orange marmalade were so much tastier with peanut butter, thus resulting in the truly perfect pbj sandwich--3/4 chunky peanut butter, 1/4 tart, fruity jam, between two small slices of untoasted bread. I cite this history of mine not to be arrogant, but so you understand when I say that these are the best peanut butter muffins I have ever eaten or made, I have researched the subject. Most peanut butter muffins have an anemic amount of peanut butter in them and lots of butter. Now, I love butter, but a peanut butter muffin should taste like peanut butter. This muffin recipe has an entire cup of peanut butter, with only a little oil. Of course, you are all familiar with blueberry muffins. But suddenly, looking into my refrigerator at a jar of blueberry jam a friend of mine had given me, I realized...peanut butter and jelly muffins are common. Blueberry muffins are also common. Why not combine the two in an unholy fusion of peanut butter and jelly awesomeness? 1. Preheat oven to 375F. Line a muffin tin with 12 liners. 2. Sift flour, salt, and baking powder in a bowl. 3. Beat milk and egg together. Add sugar, followed by peanut butter and oil. Incorporate dry and wet mixtures. 4. Fold in white chocolate chips. Pour batter into muffin liners. Spoon 1 teaspoon of jam into the center of each muffin. I complain so much about my parents' bad food habits on this blog, I really should admit that from time to time, I was wrong. As a kid, gazing at my mother's peanut butter and jelly sandwiches on rye--RYE BREAD WITH SEEDS--I considered her failure to give me a dainty pbj on Wonder Bread in my lunch box to be akin to child abuse. While I still take issue with the SEEDS, I have obviously grown to appreciate that she was a kind of accidental culinary visionary when it came to rye bread and peanut butter. Peanut butter and rye sandwiches have almost become a trendy pairing of sweet and savory. For awhile, I have been thinking...should I go there...no one else is going there. Then, my blogging friend Anna at Cookie Madness recently published a recipe for peanut butter and rye flour cookies. I figured if someone who is as serious a baker as Anna is willing to throw rye flour in peanut butter cookies...I have license to bring my idea to fruition. Oddly enough, although I felt persecuted by the persistence of rye bread in my packed lunches, I did like peanut butter and banana sandwiches, perhaps because the sweetness of the banana counteracted what I tasted as the bitterness of the rye. That, and when I finally had one, my mother had switched to seedless rye. I still have flashbacks about grape and strawberry jelly and caraway seeds, but I'm working through that. I remember the peanut butter and banana sandwich was MY IDEA. I remember the first day I ever had one. I was reading a book at home about a group of children-detectives (of course) while simultaneously playing solitaire with my mother and because the kids in the book were eating peanut butter banana sandwiches, I had to have one for lunch as well. Much to my surprise, she joined me. My mother never ate what I ate, usually--I don't remember her eating lunch when I was small, period. I thought of the pb&b as my unique idea, as if I was the first person to eat peanut butter and banana together. (We were not big Elvis fans in my household). And I never wanted white bread because I never saw a friend across the lunch table devouring one on white. To me, peanut butter and banana sandwiches had to be on rye. "You know what is also good," my mother the carnivore said. "Peanut butter and bacon." I had those occasionally as well, later on, but because I wasn't much of a meat eater back then (nor would be for the next thirty years), they didn't become a staple. 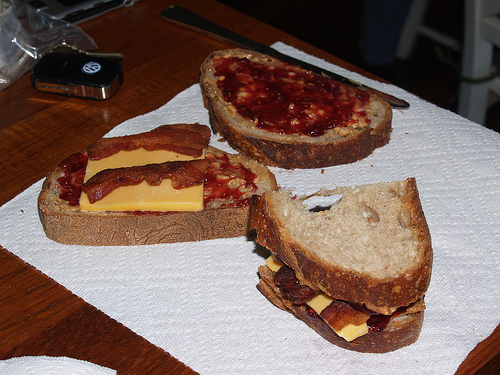 I have to admit that the peanut butter, cheese, and bacon on rye looks kind of good. An excellent solution to the dilemma of packing peanut butter and banana sandwiches that don't go brown would be to pack these muffins instead, for those of us who are old and have to work over the summer. These are sturdy and hearty, thanks to the rye flour, yet sweet with banana and dark brown sugar. I used natural chunky peanut butter, the kind you have to stir and I like the rustic complexity the texture it gave to this very simple recipe. These muffins are wonderful on their own, but in the spirit of the recipe's creation--throw caution to the wind. Smear them with butter or honey or more peanut butter. Eat then with crisp bacon in the morning. Just don't put caraway seeds in them and eat them with Smucker's grape or strawberry jelly. 2. 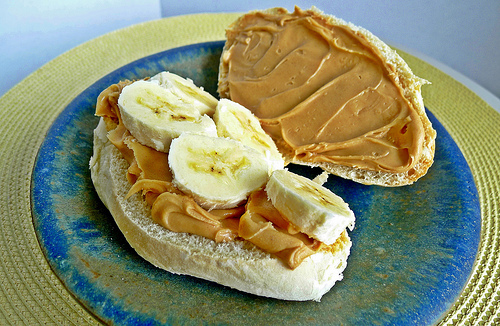 Mix the oil, sugar, banana, and peanut butter together. Sift the flour, salt, baking soda and cinnamon. Incorporate the dry into the wet. 3. Pour the batter into the muffin liners or pan. 4. Bake the muffins for 18-20 minutes until a toothpick can be extracted clean (if you use a loaf pan, obviously the cooking time will be much longer, probably slightly under an hour). There are parts of my brain that remain stuck in time. I've accepted the high price of gas and utilities but I'm always shocked that books and food cost so much. There is a part of me has never died that felt rich when she had a few dollars to spend at a cheap novelty store in the mall on plastic Smurf and Snoopy figurines (collecting was very big in the 80s) . Or on scratch n' sniff and glittery rainbow stickers. Or a Happy Meal. My original intention for this blog post was to create a white chocolate muffin with macadamia nuts in tribute to the 80s. Is there anything more 80s than walking through a mall in frosted acid-washed jeans eating a white chocolate and macadamia nut cookie from Mrs. Field's? 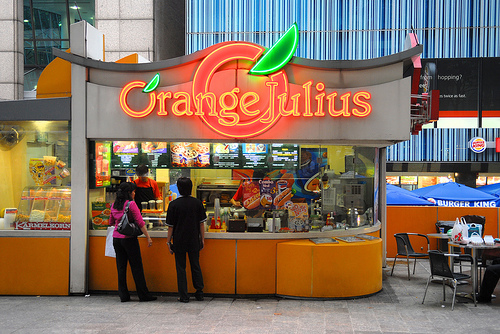 I never liked Orange Julius, but even then, at age nine, I felt a certain serenity that everything was right in the world as I passed one, followed by a Sam Goody which still sold 45s of Billy Joel's "Uptown Girl," and another store purveying t-shirts with puffy paint. In another ten years or so, no one will know what 'Side B' means. Back then, macadamia nut white chocolate chip cookies seemed terribly exotic, a step above oatmeal raisin. And muffins in various flavors also seemed quite daring in the 80s. In high school, after swim practice, I would get a huge container of Tasti-d-Lite for dinner, chased down with a 'fat free' chocolate cheese cake muffin and a peanut butter and jelly muffin from the local 7-11. I kind of knew that none of that stuff was as low calorie as it said on the label, but I deluded myself into thinking I had earned it swimming laps and it wasn't as terrible as eating the Haagen-Dazs peanut butter vanilla swirl I really wanted. And because the muffins were not blueberry (the kind my mother would buy), they tasted even better. My recipe concept was to create a white chocolate macadamia muffin, the ultimate tribute to the definitive flavor combination and iconic pastry of the late 1980s. But when I went to buy macadamia nuts at Wegmans and saw that they were $14.99 a pound, the old frugal person in me said, nostalgia or no nostalgia, there was no way I was going to pay that much for nuts for some muffins. 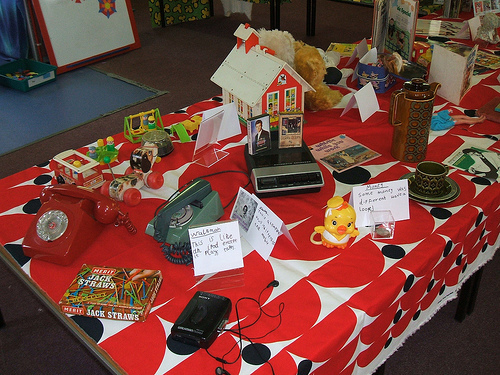 Why, I remember when ice cream sandwiches cost a quarter at lunchtime and lunch money was given to the teacher at the beginning of the day in a little, jingling manilla envelope! I had already paired pistachios with white chocolate in a previous blog post, so salty cashews seemed like another natural mate for macadamias. And they were my favorite nut as a kid, and are one of my favorite kinds of nut now. 1. Preheat the oven to 350F. Line muffin tins. The batter is sticky, so use liners. 2. Sift flours, sugar, baking powder and salt. Mix egg, yogurt, and vegetable oil in another bowl. Fold dry into wet. Fold in chips and nuts. Pour into muffin liners. 3. Bake 20-25 minutes. My 6 large muffins took 25 minutes, smaller muffins will take less time. A toothpick should be able to be extracted 'clean.' Cool before removing from pan. As a kid, I always judged a restaurant by the quality of its dessert cart. They rarely have dessert carts at restaurants anymore. Dessert carts are really 'pastry' carts, and at very high-end restaurants, prepared 'desserts' seem to be en vogue now, like poached pears in brandy sauce. Lower-end restaurants rarely have the funds for a massive amount of different confections to display every day. I lived for the dessert carts that had a wild variety of pastries--French and German, mostly. For children, the saying 'we eat with our eyes first' is very true. Being presented with a dessert cart and told to pick one pastry was like being turned loose in Child World or Toys-R-Us or a museum gift shop in the early 80s with a five-dollar bill. I loved the process of selecting just the right item. It never occurred to me to want more but nor did it make me feel guilty about the frenzied delight I took in consuming what I was allowed to have. I learned that cakes with heavy chocolate ganaches were a bit too heavy and one-dimensional for my palate. Conversely, the fluffy strawberry shortcakes with whipped cream that little girls were supposed to adore were too sweet and also bored my tastebuds. Desserts with lots of walnuts and hazelnuts were too bitter for me at the time. I learned to avoid German chocolate cake, despite its seductive caramel topping, because of the insidious coconut that lay beneath its innocent surface. But certain desserts had just the right balance of chocolate, vanilla, and creaminess. I loved eclairs, for example, and vanilla cakes with chocolate frosting or vice versa. But my all-time favorite was Black Forest Cake. My mother's and my favorite restaurant had a Black Forest cake that consisted of three layers of very rich, dense, dark chocolate cake. The inner layers were spread with chocolate icing and real, plum-like cherries. Sometimes I'd find a pit in one of the cherries, so I knew the cake was made truly from scratch. The side layers and top were covered in light chocolate frosting that tasted like chocolate mousse. The sides were festooned with dark chocolate shavings. The top of the cake was slathered in more cherry filling and bits of semisweet chocolate. Eating a single slice took me at least a half an hour, to savor every last bite. First, I would eat the bottom layer, then the center layers, and save the frosting from the sides and top for last. I talk to parents today and some have children who do not like sweets. I respect and understand that. Others, however, have children who disdain good desserts and will take a Chips Ahoy or an Oreo cookie over a slice of homemade cake every day. These children do not understand dessert carts. I pity and somehow mistrust them. A cake with sweet, very light brown German chocolate was presented to me. The cake was frosted in whipped cream--WHIPPED CREAM--which I loathed. Its sides were covered with sliced untoasted almonds on the side, which I did not like. And it was topped, not with real cherries, but maraschino cherries, like a Shirley Temple had barfed on my Black Forest cake. I took a bite and blanched. It had alcohol in it, and I don't even like spirits as an adult, and to a child that bite was like eating a slice of solid cough medicine. I learned at that moment how my 'Black Forest' was nothing like the classic Black Forest cake, but something very particular to that very special restaurant. The experience taught me that there are no 'truths,' only interpretations, long before I took literature classes on French deconstructionism. I have considered replicating My Cake. But then, if I presented you with a very dark chocolate cake embedded with real cherries and chocolate mousse frosting you would say: "That is not Black Forest cake." But given that Black Forest has come to become a synonym for anything with cherries and chocolate, I present you with these brownies, which don't even make a pretense of being authentic. The brownie recipe (one of my favorites and so easy) was adapted from here, and rather than use cherry pie filling (a pretty typical 'Black Forest' ingredient), I decided to use dried cherries. You could marinate the cherries with kirsch for a more traditional flavor and top them with whipped cream. But use real whipped cream, please! 1. Preheat oven to 350F. Line an 8X8 inch square pan with nonstick foil. 2. Melt chocolate and butter over a double boiler. Let cool, then incorporate the cocoa, sugar, vanilla, and eggs. 3. Sift flour and salt and incorporate into the chocolate mixture. Fold in the semisweet chips and 1/2 of the dried cherries. Pour the batter into the pan and sprinkle with the remainder of the dried cherries and white chocolate chips. 4. Bake for 25-28 minutes. Cool for at least one hour before slicing. I refrigerated the brownies overnight before cutting. I studied English, religion, and philosophy when I was at university, so instead of dropping out and starting a billion-dollar software company in my mother's garage like a sensible person (actually--*sniff*--my mother had no garage), I read stuff like Plato's Republic. This is directly relevant to food because in the Republic Plato talks about the world of the Forms. The world of the Forms is kind of 'the real deal,' versus what we're living in right now. This world--well, we just think of it as reality. Although we have horses, pigs, dogs, chickens, and shoes, there is the perfect (i.e. the Platonic ideal) of all of those things in the heavenly world of the Forms, and what we think of as 'real' is just an inferior copy of the original Form. And that is why we always feel like something is missing. This is relevant, because although I didn't believe in the world of the Forms as a graduate student, as an eater and as a cook, I've begun to soften to Plato. For example, the first pancake I had was a charred, slightly yellowish pancake an inch thick my mother prepared from an Aunt Jemima mix. However, when I ate thinner, more delicate pancakes with butter, syrup, and sausage at McDonald's, I sensed that I had moved closer to the Platonic pancake in my breakfast consumption. 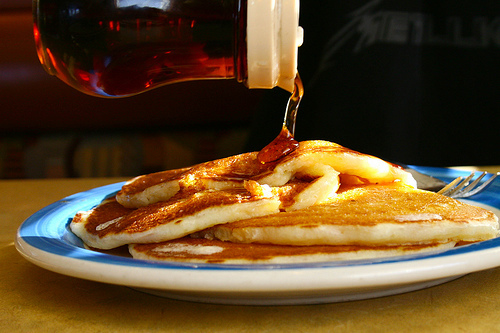 When I ate at Perkins, which had silver dollar pancakes and whipped butter so creamy it tasted almost like ice cream, and real maple syrup in pitchers in every booth, I knew I was moving even closer to the perfect, Platonic pancake. Even before I experienced the Ideal, when I consumed Aunt Jemima, I knew it was not pancake's true Form. My mother tried to delude me (much like Eddie Murphy's mother) that her thick hamburgers were just like McDonald's because they had ketchup and mustard on them. 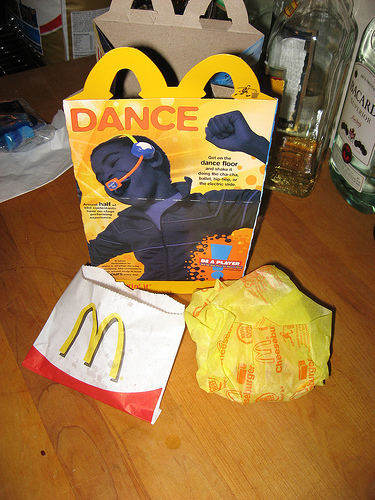 I knew that they were a pale imitation of McDonald's hamburgers, which were the only kind I would eat. These are not hamburgers like McDonald's, I would whine and demand my mother make me a hotdog instead. However, with my first bite of pizza from the local NJ pizza parlor called Atillio's, I knew that this was the Platonic pizza of which all other pizzas were a mere copy. 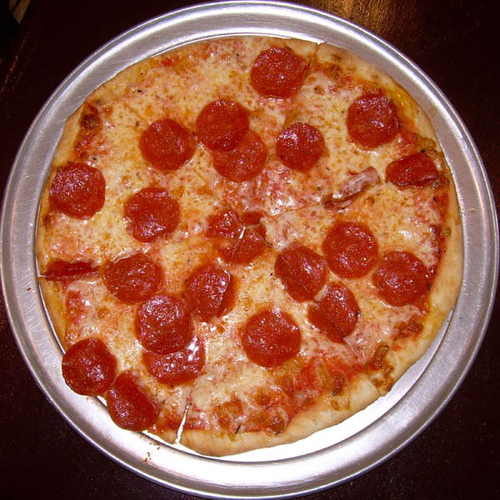 Some people might harbor the delusion that the thinner, smaller, slices they ate from rival pizzerias were the real deal and the true barbarians (remember, Plato was Greek) living in other regions of the country might call their puffy deep dish things pizza. Shadows of reality, delusions, flickers of light on the wall of a cave called Pizzeria Uno. When it came to Italian food, only non-chain pizza was acceptable in my household (both mom and dad turned their nose down at Pizza Hut), although mom did serve boxed Ronzoni and Ragu for spaghetti nights. She didn't serve Kraft Parmesan, that weird dusty cheese in the green can, but got something middle-of-the-road--a real brand of real cheese, although she never would have grated Parmesan herself. This is a very simple recipe, and while you don't have to get the Platonic ideal of grated Parmesan cheese, I'd recommend something a grade up from the stuff in the shiny green can, because the fewer the ingredients, the better they ought to be. You don't need fancy flour or the highest-quality butter. This recipe is a slightly shrunk down version of this one from Food and Wine. I didn't even bother with rolling the dough and just used a cookie scoop. I added some herbs, in contrast to the original, but you could leave them out or substitute your blend of choice for a different flavor profile. 1. Preheat the oven to 350F and line a baking sheet with parchment paper. 2. Sift the flour and salt together. Mix butter and flour until it forms a dough. Incorporate the grated cheese and spices. Use a 1-tablespoon cookie scoop to create 'cookies.' If dough is very soft, chill until slightly firm. Sprinkle cookies with more salt if desired. 3. Bake for 10 minutes. Cookies can be eaten warm or cold. This is a great, simple recipe to bake with kids when you don't want them to get totally high on sugar. It's also a wonderful 'hostess' gift, particularly if your hostess is more of a savory than a sweet person.